With the warmer months upon us and the Christmas / New Years period just around the corner, it is the prefect time to get interior organised for the events ahead. 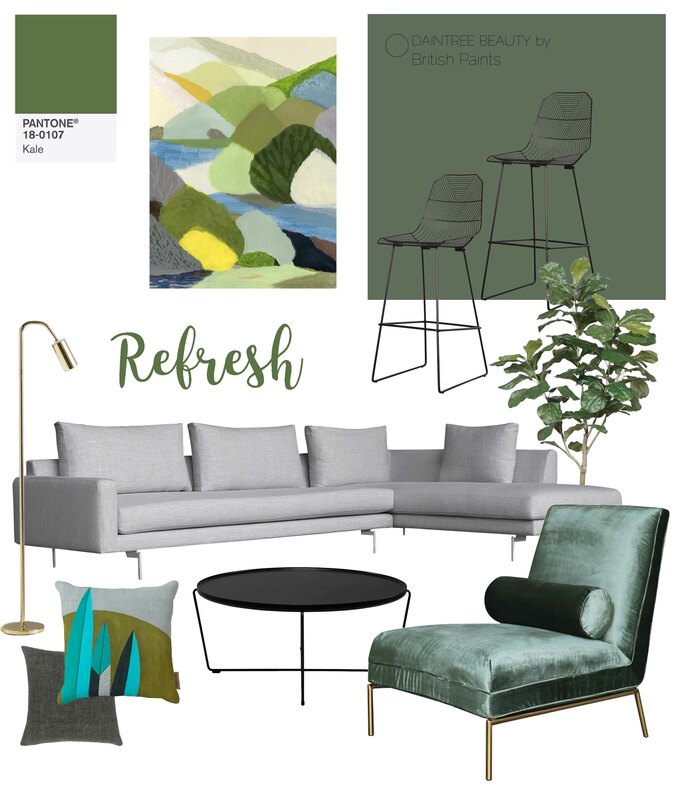 I have combined seven colours from Pantone’s 10 colour predictions for Spring 2017 Fashion Show into five looks as a starting point to inspire you to freshen up your abode. As exact Pantone matches can be tricky to come by here in Australia we have teamed up with British Paints to help you achieve the look. Look #1: Blue has always been seen as a symbol for stability, the lighter shades do tend to have the most calming influence but as the colour starts to go darker complexity, depth and boldness come to the forefront. 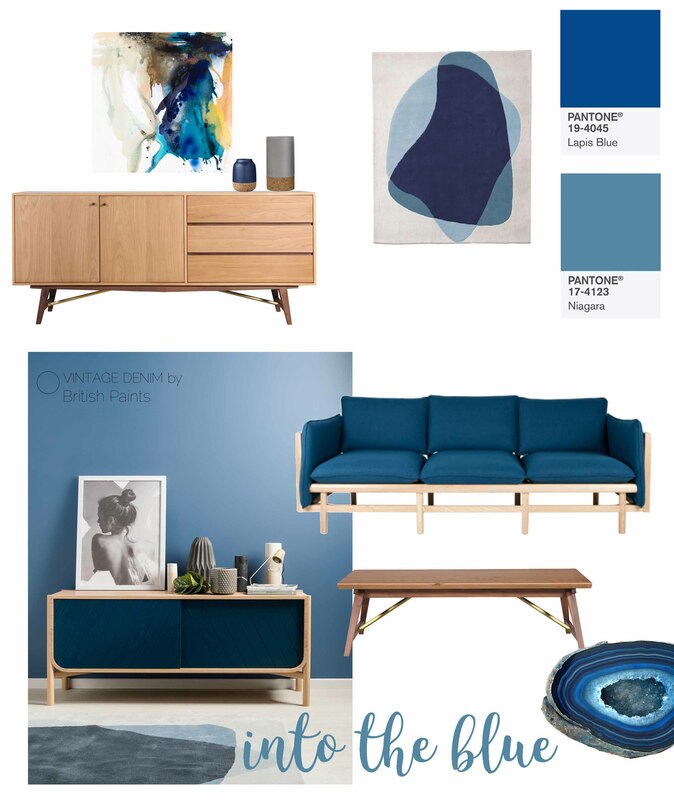 Vintage Denim by British Paints as seen in Clickon’s Latest Something Out of a Dream campaign expressed this perfectly while the Marius sideboard by Hartô Paris adds a bit more drama. Prudence Caroline’s Miura Concept has a great depth of colour, inspired by the 1967 Lamborghini and the rugged coast line, and available exclusive to Clickon it captures the essence of this bold blue trend. 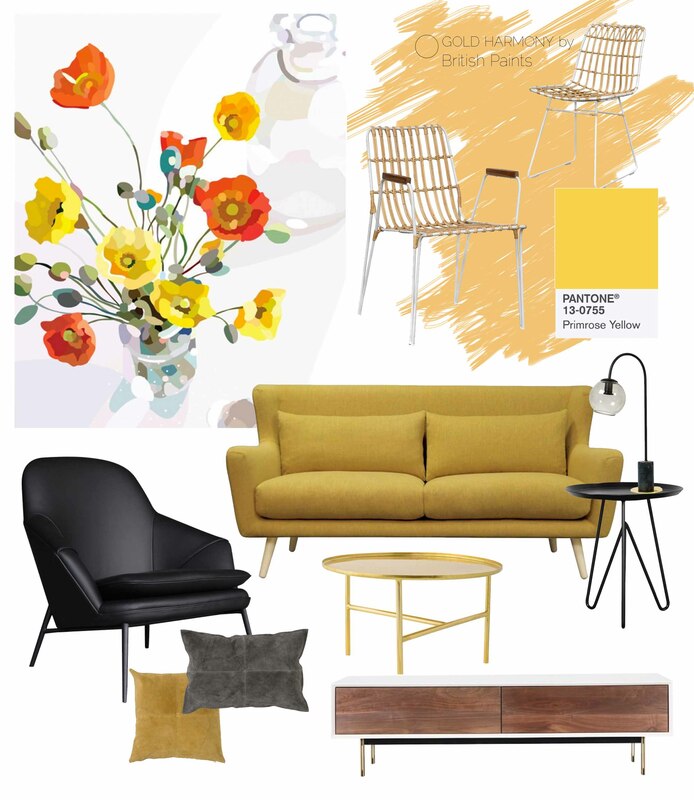 Look #2: Yellow accessories are great for brining vibrancy into any space, but as a wall colour it can become quite overwhelming. I suggest Gold Harmony by British Paints if you would like to add some warmth to your walls, this colour goes so well in a kitchen or entry space. Primrose Yellow by Pantone is the perfect example of a cheerful, happy yellow emulated in Kimmy Hogan’s latest Spring I Print. Gold accents can also be a great way to bring the positive vibes into your space but with a little more glamour. Look #3: Green is synonymous with nature and thus is no surprise that it is known as the most restful colour to the human eye. Pantone’s Kale is quite a bright green which can be seen in certain parts of Belynda Henry’s Watte print. For your walls I recommend Daintree Beauty, and ode to Australian rain-forest. In my opinion the best way to bring a touch of green into your home is through plants, our Fiddle Leaf Plant is great for those who don’t have a green thumb. If you are after something a little more luxe, the velvet Safino Lounge Chair makes it a real statement piece out when paired with a grey such as the Edge V2 Sofa shown here. 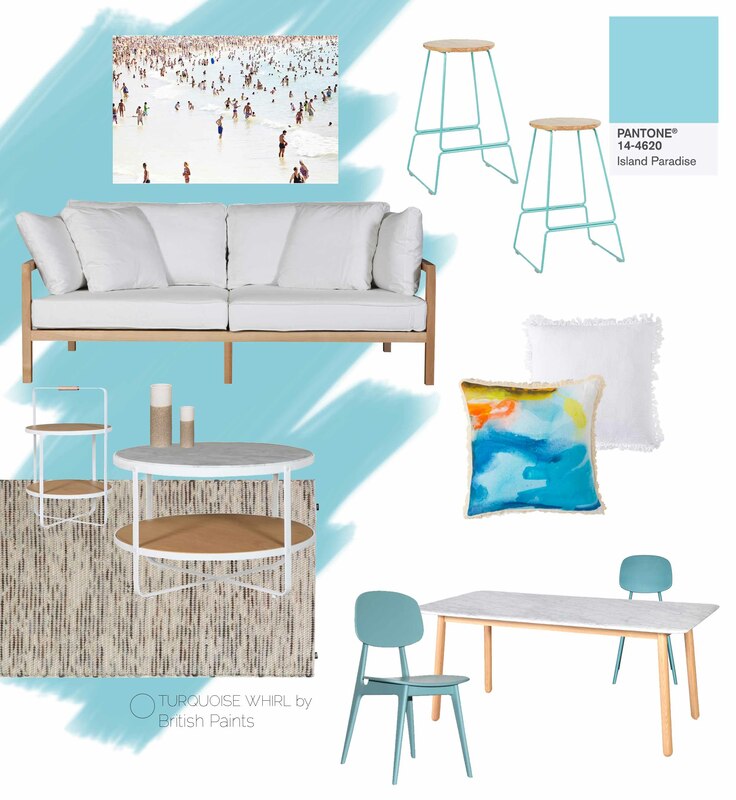 Look #4: It seems like blue really is the colour of the season, this spread inspired by Australia’s Bondi Beach and Armelle Habib’s Print will keep you house looking fresh and full of life all year round. The White Lester 3 Seat Sofa is a modern alternative to the classic Hampton’s style lounges creating an overall look that is Clean and minimalistic. The Oxygen range by Sketch Interior and the Megan Dining Table bring marble into the space while the timber detailing ensures it isn’t over powering. 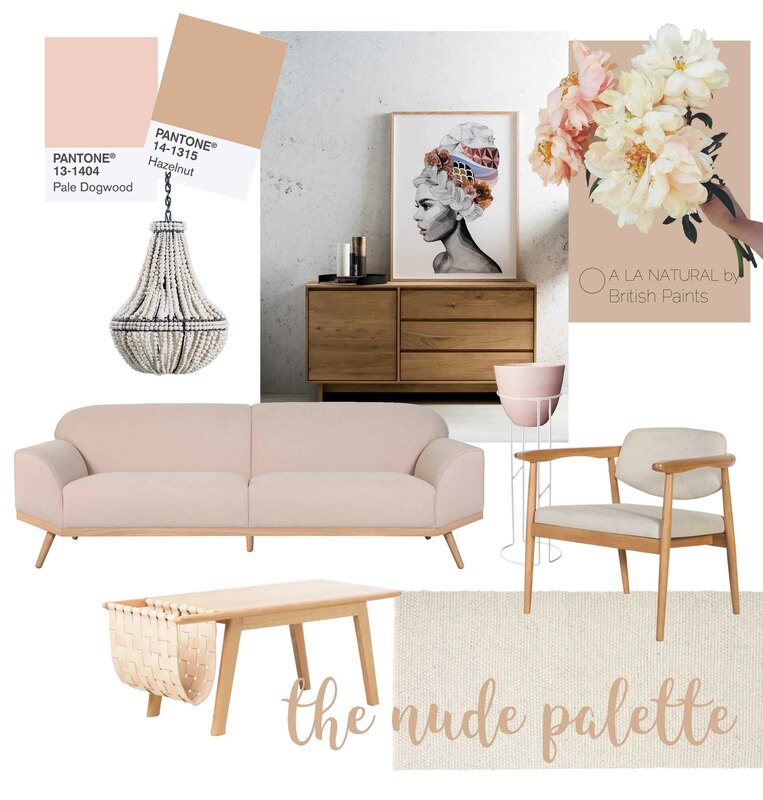 Look #5: Pale Dogwood and Hazelnut by Pantone are the new nudes for the season. Light pinks promote a peaceful environment especially when paired with the Ivory Copenhagen rug by Tribe Home and beige Kardell Lounge Chair. Products from the Ethnicraft range add a natural earthiness to the space while the modern designs ensure that the room stays polished. Our Klaylife pendants made by local women on a small farm in Kwazulu-Natal, South Africa are a great talking point that really does exude effortless style.